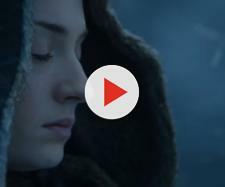 'Game of Thrones': this mountain from episode 6 trailer may be important in the war against the Others, and here's why! In his vision, The Hound sees a mountain that "looks like an arrowhead." "The dead are marching past, thousands of them," the Hound says. 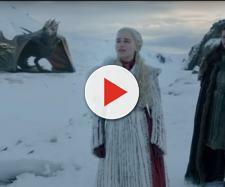 In the picture above you can see the Arrowhead mountain: Jon, The Hound, Beric, Thoros, Tormund, Gendry, Jorah and a few others will reach the nearby of this location in the next episode of "GOT" (where they're going to be attacked by wights and White Walkers, as we can see from the next episode's trailer). The same mountain featured in episode 6 trailer appeared in the background of the flashback scene in which Bran "sees" the creation of the Night's King by the Children of the Forest. During the flashback we can see the Arrowhead mountain from the other side; since Jon is approaching the mountain from the south, we can deduce that the creation of the White Walkers took place north of the mountain. It's very interesting to note how lush and green the place is in the flashback: thousands of years ago the deep north was incredibly verdant. Why was the region so different in the past? Many fans think that this could be connected with the creation of the Night's King (the land was somehow cursed) or with the fact that White Walkers bring the winter with them. Although we cannot exclude these hypotheses, we must point out that the Children of the Forest's flashback takes place thousands of years ago; it's also known that in the 'GOT' universe seasons can last decades, therefore it's plausible to think that the northernmost lands were verdant at a certain point of the Known World's history. Moreover, if the Night's King is the winter, then it would make sense for winter to abruptly end in the case of the Night's King's death, and such a happily-ever-after finale sounds way too positive for a man like George R.R. Martin. It looks significant that Jon Snow and his crew are approaching the place where the Night's King was created. This also reminds us of the connection between the Children and the White Walkers, which we think is totally going to matter in the Great War. All these clues about the Children of the Forest, the White Walkers and the place where the Others were created must lead to something important. Perhaps finding out why the Arrowhead mountain looks significant for the story may be the key to destroy the White Walkers. Don't forget! "Game of Thrones" season 7 episode 6, titled "Beyond the Wall" airs on August 20 on HBO.